A Maui Vacation Has It All! For visitors looking for a bit of seclusion with a dash of sophistication, a Maui vacation is a perfect fit. It’s the second-largest island in Hawaii, and boasts natural wonders, expansive hotels, and upcountry charm. Those who live there like to say “Maui No Ka Oi” (Maui the best), and it’s not hard to understand why. King Piilani was the first ruler to unite all of Maui under a single family of alii (royalty) in the early 15th century. In 1790, King Kamehameha I defeated Kahekili, Maui’s last king, after a fierce battle in the iconic Iao Valley. Kamehameha took control of Maui and made Lahaina the new capital of the unified Hawaiian Kingdom. For nearly five decades, Lahaina served as the center of government for Hawaii. Simultaneously, the town experienced a surge in its whaling industry. At the height of the whaling era (1840-1865) as many as 500 ships anchored in Lahaina’s port. Haleakala Sunrise and Sunset: Haleakala means “house of the sun,” and many visitors choose to take advantage of the spectacular sunrise and sunset from the nearly 10,000 feet above sea level.Depending where you get started from on Maui, it can take you up to two hours to drive the HaleakalaHighway (HI 37) and then up the winding Haleakala crater leading to the summit. This is Hawaii, but it gets very cold at the summit. 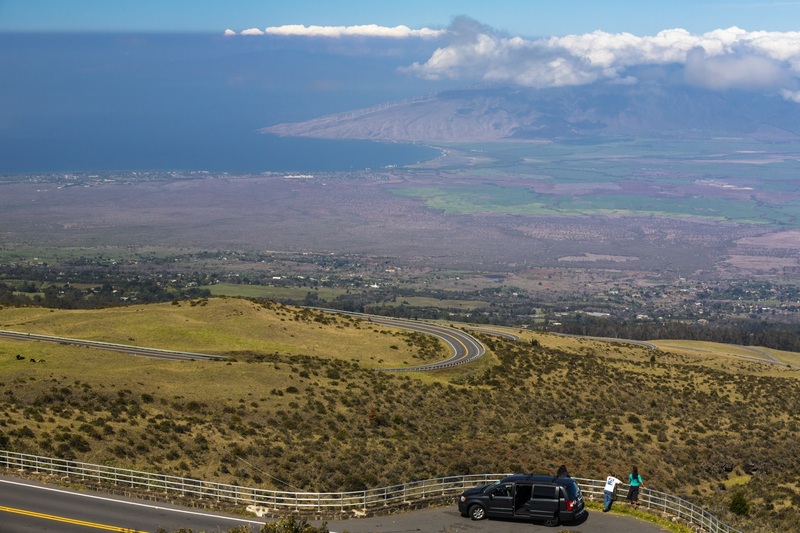 The temperature drops 3º for every 1000 feet of elevation, so at the Haleakala Visitor Center’s 9,740-foot elevation (where most people watch the sunrise) it’s about 30º colder than at sea level. If you stay just ten to twenty minutes later, you’ll be treated to an incredible show as the colors of dawn stretch across the landscape of the island. Not an early riser? Take a leisurely drive up the summit and give yourself some time to explore before the sun goes down. Watching the sunrise or sunset from the summit of Haleakala is one of the most popular tourist experiences on Maui. Hana, Maui: Along Maui’s rugged eastern coastline is the peaceful town of Hana, considered one of the last unspoiled Hawaiian frontiers. The legendary road to Hana is only 52 miles from Kahului, however the drive can take anywhere from two to four hours to complete since it’s fraught with narrow one-lane bridges, hairpin turns and incredible island views. The Hana Highway (HI-360) has 620 curves and 59 bridges. The road leads you through flourishing rainforests, flowing waterfalls, plunging pools and dramatic seascapes. Beyond Hana, venture 10 miles south to the outskirts of Haleakala National Park in Kipahulu. There you’ll find the popular Pools of Oheo, where waterfalls spill into tiered pools leading to the sea. View these tranquil natural pools or hike up the Pipiwai Trail to the 400-foot Waimoku Falls. Iao Valley State Park: Located in Central Maui just west of Wailuku, this peaceful 4,000-acre, 10-mile long park is home to one of Maui’s most recognizable landmarks, the 1,200-foot Iao Needle. This iconic green-mantled rock outcropping overlooks Iao stream and is an ideal attraction for easy hiking and sightseeing. It was here in 1790 at the Battle of Kepaniwai that King Kamehameha I clashed with Maui’s army in his quest to unite the islands. Even with Iao Needle serving as a lookout point, Kamehameha defeated Maui’s forces in a ferocious battle that ultimately changed the course of Hawaiian history. Kaanapali Beach: Fronting Kaanapali’s hotels and resorts, this former retreat for the royalty of Maui is now a popular getaway for the world. Kaanapali was Hawaii’s first planned resort and has become a model for resorts around the globe. Five hotels and six condominium villages face this renowned beach. Also fronting Kaanapali is the open air Whalers Village, a world-class shopping complex that has a variety of exceptional shops and restaurants, a renowned whaling museum and free Hawaiian entertainment. Kaanapali also has two championship golf courses, the Royal Kaanapali and the Kaanapali Kai. Lahaina, Maui: Once known as Lele, which means “relentless sun” in Hawaiian, Lahaina is a historic town that has been transformed into a Maui hot spot with dozens of art galleries and a variety of unique shops and restaurants.Today, Lahaina is on the National Register of Historic Places. You can still get a feel for old Lahaina as you stroll down lively Front Street and visit historic stops like the U.S. Seamen’s Hospital, Hale Paaho (Lahaina Prison), the Pioneer Inn and other sites on the Lahaina Historic Trail. 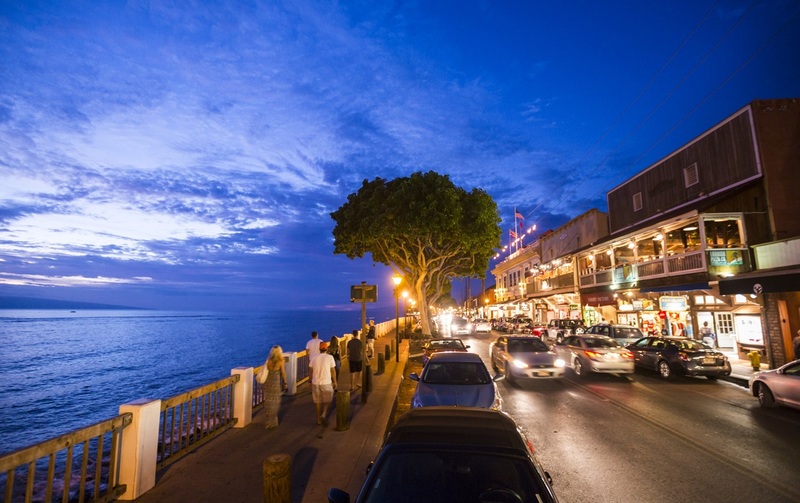 Approximately 55 acres of old Lahaina have been set aside as historic districts. And during the winter months, don’t forget to set sail from Lahaina Harbor on an unforgettable whale-watching tour. The channel off the coast of Lahaina is one of the best places in the world to spot humpback whales. Even these magnificent creatures can’t get enough of Lahaina. Lahaina is a great place to catch a whale-watching tour, eat at fabulous restaurants, and visit historic sites. Makena Beach State Park (Big Beach), Maui: Maui’s southwestern shores are home to many extraordinary beaches and Makena Beach, also known as “Big Beach,” is one of the island’s best.This is one of the largest beaches in Maui, with golden sands extending nearly 2/3 of a mile long and 100 yards wide. Visitors can swim or snorkel in these pristine waters, picnic in the shade, or simply sunbathe on the seemingly endless expanse of sand. Upcountry, Maui: Rolling hills and misty mountains unfold as cool breezes carry the scent of eucalyptus throughout Upcountry Maui. Located on the high elevations around Haleakala, the fertile slopes of Upcountry are home to ranches and farms with soaring views. Kaanapali Beach: West Maui’s “signature” beach, Kaanapali Beach offers three miles of white sand. Easy walking access from all Kaanapali hotels, this was named “America’s Best Beach” in 2003.” Puu Kekaa, also known as Black Rock, on the northernmost section of the beach is excellent for snorkeling. D.T. Fleming Beach Park: This classic Kapalua beach was named “America’s Best Beach” in 2006. Facilities include picnic tables, restrooms and lifeguards. Kapalua Beach: Known to Maui veterans as Old Fleming Beach, Kapalua was the first of Maui’s beaches to be named “America’s Best Beach” in 1991. Launiupoko Beach Park: Just south of Lahaina, this local favorite offers a unique natural pool surrounded by a lava rock wall excellent for small children. Picnic tables and restrooms are available. Puamana Beach County Park: This Lahaina beach provides swimming, picnic tables, restrooms, grills and a grassy park with waves that are excellent for beginning and intermediate surfers. Kamaole Beach Parks I, II, and III: Ample parking, lifeguards, volleyball courts and excellent swimming conditions make the Kamaole Parks in Kihei local favorites. Keawakapu Beach: A beachcomber’s delight with classic views, this Kihei beach is a half-mile walk to the Wailea Resort. Kihei Beach: A series of beaches, coves and tide pools along six-miles of Kihei coastline. Some areas offer lifeguards, restrooms and picnic facilities. Makena Beach State Park (Big Beach): Makena Beach State Park is one of Maui’s signature beaches. With white sands extending nearly 2/3 of a mile long, it is one of the largest beaches in Maui. Polo Beach: This Wailea beach is popular with Maui locals and visitors. Picnic tables and restrooms are available. Wailea Beach: Named “America’s Best Beach” in 1999, Wailea offers excellent swimming with restrooms and equipment rentals. A paved beach walk lets you meander past Wailea’s hotels, restaurants and shops. H.A. Baldwin Beach Park: This picture-perfect Paia beach with excellent swimming and bodysurfing. Also features a “baby beach” with a lagoon. Lifeguards, restrooms and picnic facilities are available. Hookipa Beach Park: A world-famous contest venue for professional windsurfing. Winter surf can be massive, with excellent and safe viewing for photography. Picnic tables and restrooms are available. Hamoa Beach: Author James Michener called Hamoa Beach the most beautiful in the Pacific. This Hana beach was named one of “America’s Best Beaches” in 2006. You’ll find outstanding swimming and bodysurfing as well as showers and limited facilities on this family-friendly beach. Hana Beach Park: A favorite with local families, Hana Beach Park is one of the most popular swimming beaches on the island. Many local community events are held here. Wainapanapa State Park: Excellent camping facilities make Waianapanapa State Park one of Maui’s best beaches. You’ll find a black-sand beach with good swimming, snorkeling and freshwater pools. Maui is the ideal destination for visitors who want plenty-to-do, but need a little more space to do it. So, if you’re looking for natural beauty, modern amenities, and scenic adventures, make “The Valley Isle” your next stop!